This event is COMPLETELY SOLD OUT. A waiting list for available tickets will begin at 2:15 PM when the doors open. Any available tickets will be sold on a first-come first-served basis. Prices will range from $25-$88. We will do our best to accommodate everyone as space and safety permits. Will call opens at 2:15 PM inside the main doors of the church. Audience members needing to pick up tickets can do so starting at 2:15 PM. Please allow extra time. The concert will begin promptly at 3 PM and late seating will be at the discretion of the ushers. Featuring Ralph Vaughan Williams' Fantasia on Christmas Carols and Gustav Holst’s Christmas Day, this heart-warming yearly favorite includes traditional carols for the whole family to sing together. All performance dates, artists and programs subject to change. Tickets are non-refundable and non-transferable. DOORS OPEN at 2:15 PM for a 3 PM concert start time. LATE SEATING is at the discretion of the House Management. 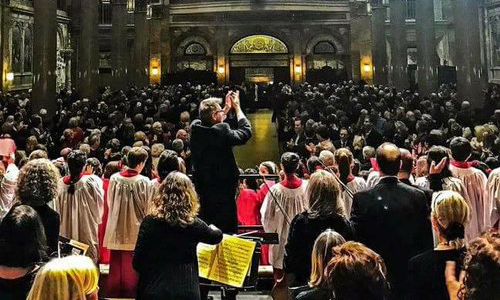 Latecomers may be asked to remain in the back of the church until there is a break in the program, so as not to disturb the performance or other audience members. WILL CALL is available when the doors open at 2:15 PM inside the main doors of the church. CHILDREN seated in an adult's lap do not need a ticket. Children seated in a chair or pew do need a ticket. We no longer offer tickets for sale or any ticket pickup at the Parish House Reception desk. Audio and/or video recording and flash photography are not permitted during performances. The Church of St. Ignatius Loyola is wheelchair/walker accessible via the ramp entrance on 84th Street (between Park and Madison Avenues). The restrooms are NOT easily accessible by wheelchair. The most easily accessible restrooms are in the Parish House (980 Park Avenue). There are two steps down from the street level into the Parish House and there is a restroom on that ground floor. For reserved seating concerts, there is available seating for wheelchairs and companions. Please look for the Wheelchair and Wheelchair Companion tickets when purchasing. For general seating concerts, follow the directions of the ushers. Please call ahead (212-288-2520) to discuss any special seating requirements. Street parking can be difficult to find, but there are a number of parking garages nearby. There are garages on 83rd Street (between Park and Lexington Avenues) and 84th Street (between Park and Lexington Avenues), as well as near the Metropolitan Museum of Art. There are a number of fine and casual eating establishments located nearby on Madison Avenue (one block west of the church), Lexington Avenue (one block east of the church), Third Avenue (two blocks east of the church) and Second Avenue (three blocks east of the church). The Church of St. Ignatius Loyola is easily reached via the 4, 5, and 6 subway lines (86th Street station), or buses on Madison, Lexington and Fifth Avenues, and on 86th Street. © 2019 ShowClix on behalf of The Church of St. Ignatius Loyola. All sales are final. Tickets are non-refundable.